My wife has many Royal Descents. The most recent English monarch she descends from is Edward III (died 1377). She has 23 descents from Edward III. This page shows them all. She has so many descents from Edward III that they cannot fit on a single graph. The most recent monarch of any sort she descends from is James II, King of Scotland (died 1460), who himself descends from Edward III. She has one descent from James II, King of Scotland. The most recent English monarch that my wife descends from. 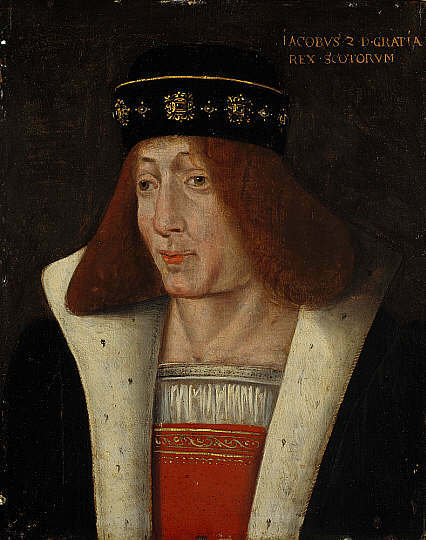 James II, King of Scotland (died 1460). The most recent monarch of any sort that my wife descends from. My wife's Royal Descent is not really a discovery. Her family always knew they were descended from the 10th Earl of Pembroke. It was simply a matter of an afternoon by me in 1995 in the library at Cambridge following the lines through Burke's Peerage and the Complete Peerage to see that the 10th Earl descends from Edward III. 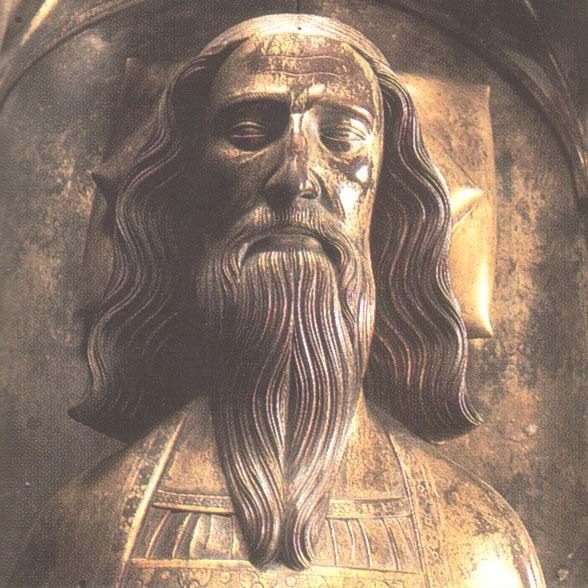 I found it on the first day, whereas I have so far spent years trying to prove my own descent from Edward III. I soon found out that both the 9th Earl of Pembroke and Mary Fitzwilliam descend from Edward III. See my knowledge of the Royal Descent as at April 1999. In 1998, my wife and I discovered a descent of Arthur Gibbon from Katharine Skene (and hence from Robert III, King of Scotland and Henry I) by matching a single page of notes on Skene in the Gibbon family papers with the published genealogy of Skene and the Aberdeen parish records. In 2005-06, I worked out a descent of Mary Kerr from the main Kerr family (and hence from Robert III, King of Scotland and Henry I) after a tip-off in 2005 from Kelsey Williams. In 2007, I discovered that Kitty Hunter descends from Sir Thomas Orby, 3rd Baronet rather than just the 1st Baronet, and hence descends from Edward III. So both Kitty Hunter and her lover the 10th Earl of Pembroke descend from Edward III. Further descents of Kitty Hunter and the 10th Earl of Pembroke from Edward III keep coming in. Thanks for these to Leo van de Pas and John Plummer and Steve Riggan. In 2009, I got the best descent of all when I read in [Roberts, 2008] that General Robert Hunter descends from James II, King of Scotland, descendant of Edward III. Kitty Hunter's ancestor Sir Charles Somerset (died 1599) has a remarkable male-line descent from Edward III. Previously I had him in error here as son of the 4th Earl of Worcester, which would give many more Royal Descents. This was incorrect. He is son of the 2nd Earl, not the 4th Earl. Henry Herbert, 10th Earl of Pembroke (died 1794). 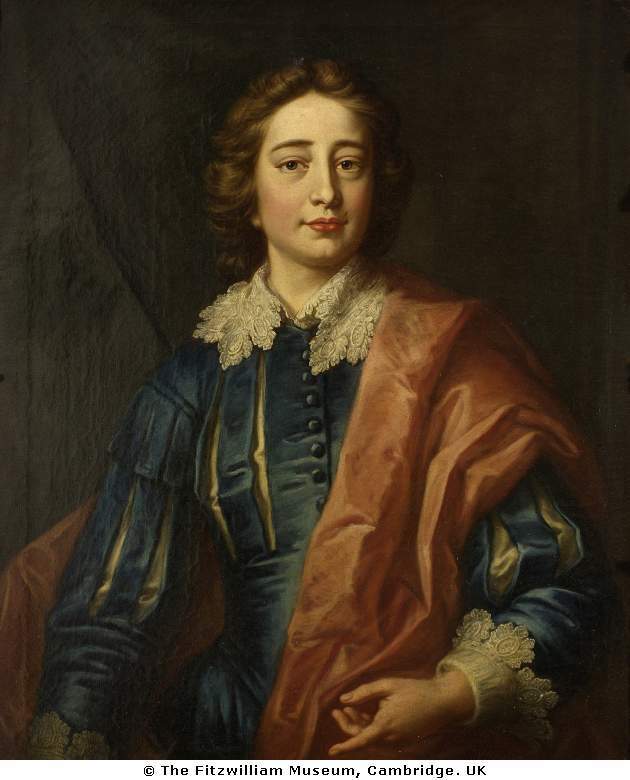 Richard Fitzwilliam, 5th Viscount Fitzwilliam (died 1743). My wife's most recent titled ancestor. Used with permission of Fitzwilliam Museum, Cambridge.